It give you full detail of price you should use or you want to use with all PayPal and eBay fees. 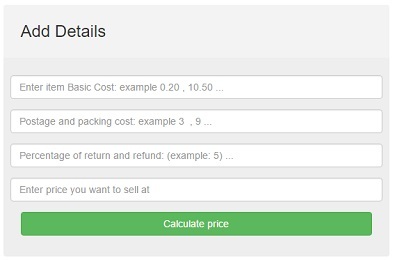 You can add the price you bought the item at, the postage cost for sending the item, the percentage of return, return and resend and at what price you want to sell the item. This will give you detail of item price, postage cost, percentage of return or refund and how much profit you can earn if you tell on that price. This will show you different prices with its percentage of profit and its cost. We help you to combine all of your eBay order and make a file which have 10 to 12 order per page with your short title, easy to print and dispatch.